Paulist Fr. Steven Petroff is a native of Clarkston, MI. He earned a B.A. from Oakland University in Rochester, MI, and an M.S. in Hispanic literature and linguistics from Georgetown University in Washington, D.C. He then spent 20 years in Los Angeles working in marketing and strategic planning for a variety of international companies. He joined our novitiate in the fall of 2011 and made his first promises to our community in 2012. He made his final promises on Sept. 2, 2016, and was ordained a transitional deacon on Sept. 3, 2016. Fr. Steven was ordained a priest by Bishop Gerald Kicanas of Tucson, AZ, on Saturday, May 20, 2017, at our mother church, the Church of St. Paul the Apostle, in New York City. He celebrated his Mass of Thanksgiving ("First Mass") the next day, May 21, 2017, also at the Church of St. Paul the Apostle. 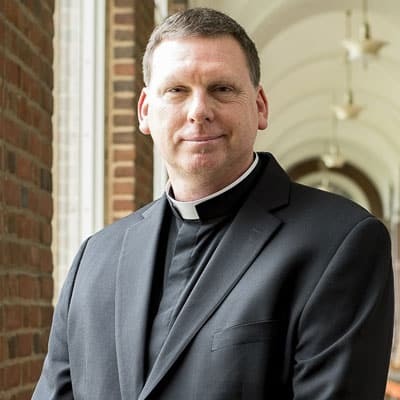 In his first priestly assignment, he is serving as associate pastor of Old St. Mary's Church in Chicago. "I've felt a call to the priesthood since I was young, but have spent much of my adult life running from it or making excuses. After years of spiritual wandering, exploration and struggling with my Catholic faith, I came to realize that God's love is bigger and more generous than I can imagine - and that this love includes me just as I am. I was drawn to the Paulists by their dedication to outreach, compassion and building bridges of inclusive communication among Catholics and beyond. The Paulist mission to meet contemporary culture on its own terms and present the Gospel in compelling, modern ways inspires and motivates me." "Right Place, Right Time": A profile of Fr. Steve just before his ordination to the priesthood.